Staphylococcus epidermidis causes infections commonly associated with patients with indwelling medical devices due to its ability to form biofilms, bacterial structures attached to a surface and embedded in a protective matrix. Cells within biofilms are known to be more resistant than free-floating planktonic cells to the host immune response and also to antibiotic therapy often leading to relapsing infections . Frequently, surgical removal of an infected device is required to resolve these infections, resulting in significant effects in a patient's quality of life. Hence, preventative approaches are clearly needed to overcome this challenge. Antibodies have been shown to be one promising alternative to target surface-attached molecules and inhibit biofilm formation . We have previously shown that human monoclonal antibodies (mAb) specific for poly-β-1,6-N-acetylglucosamine (PNAG) were effective in killing S. epidermidis in opsonophagocytic in vitro assays, and in protecting the murine host against infection by PNAG-producing pathogens [3,4]. Since S. epidermidis biofilm accumulation is mainly mediated by PNAG, it was hypothesized that the binding of this molecule by a specific mAb could impact biofilm accumulation, a process that has not previously been investigated. Here we tested the previously characterized mAb F598 , for inhibition of S. epidermidis biofilm accumulation in vitro. Several concentrations of mAb F598 and the isotype control human mAb F429 (specific for the Pseudomonas aeruginosa alginate capsule) , were co-cultured with bacteria in static conditions for 1h at 37oC to allow antibody binding. Thereafter, cultures were incubated for 24h at 37oC with shaking at 250 rpm. Biofilm accumulation was then quantified by the standard crystal violet staining . Depending on the S. epidermidis strain used, the presence of mAb F598 had a differential effect on biofilm accumulation. In the case of the ATCC strain RP62A we observed a 42% reduction in biofilm accumulation at the highest mAb concentration tested, while the clinical strains 1457 and M184 grown in the presence of mAb F598 had a dose-dependent increase of the biofilm accumulation. 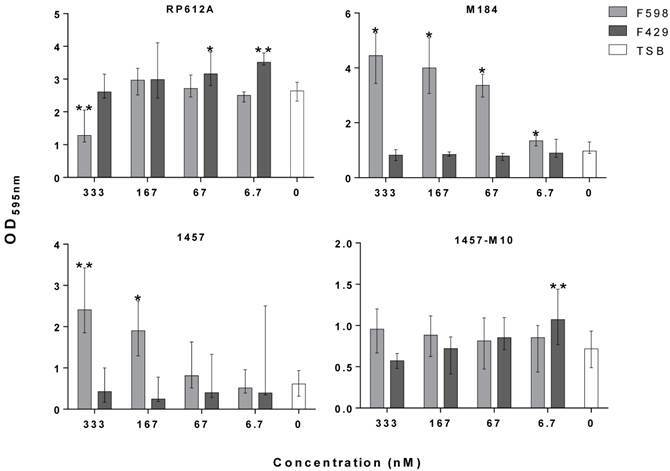 In the case of the PNAG-deficient, ica-mutant strain 1457-M10, as expected, no significant effect was found on the biofilm biomass as no PNAG is produced. Furthermore, control mAb F429 had no significant effect on S. epidermidis biofilm accumulation. The results with the ica-mutant and mAb controls suggest altogether that the inhibitory or enhancing effect of the mAb is PNAG-dependent. As observed in other studies that have used antibodies specific for S. epidermidis surface molecules, the observed enhancement of biofilm formation could be a result of increased PNAG expression caused by the early blockage of the synthesis of this molecule . On the other hand, the specificity of mAb F598 for epitopes on PNAG that do not require the N-acetyl groups on the glucosamine monomers may have contributed to the differential effects in biofilm accumulation. These would thus depend on the level of PNAG acetylation of individual strains, ultimately, controlled by the IcaB extracellular deacetylase. Therefore, mAbs directed to other epitopes might be better suited for inhibition of in vitro biofilm accumulation. Additionally, the results presented here suggest that a difference between the effect of mAb F598 against PNAG-producing bacteria in animal models [3,4] and it efficiency at inhibiting in vitro static biofilm accumulation among different S. epidermidis strains. Notably, many biofilms are formed under flow conditions and it is not clear to what extent shear stress from flow over in vivo biofilms contributes to biofilm formation, and whether under those conditions the effect of mAb F598 might be different. While the stimulation of biofilm formation by S. epidermidis grown in vitro may raise questions regarding the usage of mAb F598 in vivo, the results do not necessarily exclude that mAb F598 could be effective in vivo against biofilm infections. The majority of studies that reported strong biofilm inhibition by monoclonal or polyclonal antibodies used only a few strains in the assays [2,8], which could result in misleading interpretations. The findings presented here further stress the necessity to use more than a few strains when testing the efficacy of new biofilm-inhibition strategies in order to ensure that the desired effect is observed in a representative number of clones of the species under study. Effect of mAb F598 specific to PNAG on S. epidermidis biofilm accumulation in vitro. The bars represent the median and the error bars the interquartile range of two independent experiments with quadruplicates for each concentration tested. Statistical significance was analyzed using Kruskal-Wallis one-way ANOVA Test and Dunn's Multiple Comparisons Test with a 95% confidence level (GraphPad Prism version 6). *p<0.05, ** p<0.01 vs. TSB. This work was funded by European Union funds (FEDER/COMPETE) and by Portuguese national funds (FCT) under the projects with reference FCOMP-01-0124-FEDER-014309 (PTDC/BIA-MIC/113450/2009). AF acknowledges the financial support of individual grant SFRH/BD/62359/2009. GBP is an inventor of Intellectual Property (IP) (PNAG Vaccine and human monoclonal antibody to PNAG) that is licensed by Brigham and Women's Hospital (BWH) to Alopexx Vaccines LLC, and Alopexx Pharmaceuticals LLC, companies in which GBP owns equity. As an inventor of the IP, he also has the right to receive a share of licensing-related income (royalties, fees) through BWH from Alopexx Pharmaceuticals and Alopexx Vaccines. GBP's interests were reviewed and are managed by the BWH and Partners Healthcare in accordance with their conflict of interest policies. Corresponding author: Nuno Cerca, email: nunocercauminho.pt Tel: +351 253604423.